(EUNN) London – Passengers aboard a hijacked Turkish plane managed to jump to safety when hijackers forced the plane to land in southern Turkish city of Antalya, officials said on Saturday. Most of the 136 passengers and six crew on board managed to escape the plane by breaking the rear door and emergency exits of the plane after the pilots landed the plane on the grounds that they needed to refuel. The two hijackers were said to be from Iran. Officials said the hijackers were members of al Qaeda. Officials said only the two hijackers as well as four passengers and two crew members were still on board. 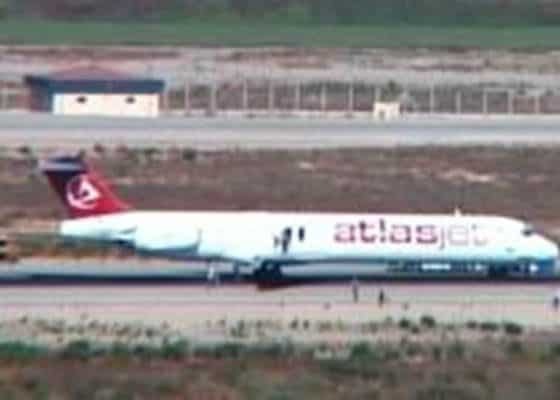 An official from Turkish Cypriot Ministry of Transportation told NTV Television that the two hijackers were Iranians. The hijackers had surrendered to Turkish authorities after having demanded the airplane be diverted to Iran. The entire ordeal lasted four hours. Transport Minister Osman Gunes contradicted local authorities saying One of the men was Turkish and the other was believed to be a Palestinian carrying a Syrian passport. Earlier, Turkish Cypriot authorities said the men were Iranians protesting US policies, and some passengers said the hijackers claimed they were affiliated to al-Qaeda. A passenger aboard the Atlasjet flight told NTV Television that the two hijackers first tried to breakdown the door to the pilots cabin but failed. “They claimed to have bombs,” he stated. Another passenger said the hijackers stated “we’re Muslims” and then after promising not to harm the passengers agreed to let the women and children go, but video from NTV Television shows the passengers jumping from the rear of the plane after one man got up and broke down the rear emergency exit when all of the passengers began streaming out of the back and the pilots crawled out of the cockpit side windows.